I have a confession to make: When I was writing this article, I printed off my first draft. While researching the topic further, I realized I could have met this need for a printout with a portable second screen (yes those exist). I have now purchased one, and can thankfully remain faithful to the claim I make later on. Many people still don’t acknowledge the burden of using paper to run their business. In this article, I’ll give you an outline of ways to improve your efficiency by ditching the white stuff. I’ve been delayed so many times by printer malfunctions and filing cabinets full of years-old records and documents. Why should we stand for this kind of inconvenience anymore, at a time when so much innovative technology is available? Going paperless means moving on from photocopiers, printers, paper contracts, notebooks, paper invoices, paper-based bulletin boards, and—depending how far you decide to take it—virtually anything else that might be printed or written on. I’m sure you like the ease of note-taking on paper. But how often do you come back to those notes, once they’re away in a drawer somewhere, creased up? What if you lose the paper you made the notes on? When your notes are saved online, they’re safer, better protected from those who aren’t supposed to see them, and shareable with those who are. They become part of the increased efficiency your company will benefit from. What does one piece of paper mean in the grand scheme of things? PulpWorks says that if one run of the Sunday New York Times were recycled, it would save 75,000 trees—and that 17 trees are saved with each ton of recycled paper in the U.S. If one run of the Sunday New York Times were recycled, it would save 75,000 trees. According to ForestEthics (promoting environmental responsibility in large organizations), the average North American goes through 504.84 pounds of paper each year. That’s roughly the weight of an adult moose. To give you an idea of what larger companies are aiming for and to put things into perspective, REI proudly stated a reduction of direct mail and catalog paper usage from 4,306 tons to 3,254 tons annually (2009 to 2010). This is their largest paper usage area, followed by shipping boxes, product packaging, and office paper. Maybe you don’t track these kinds of figures, or don’t even want to in the short to medium term. That’s fine. The important thing is that you’re thinking about it. What are the main tech-based paperless options for small businesses? These are just a few of the modern paper alternatives on the market. While they may bring a substantial upfront cost (particularly for high-end models), they will save time and money in the long run. Second screens are a great idea, and they will stop you printing something out to “have it right there.” Air Display is a program (with a compatible app) which lets you use your tablet or even smartphone as a second screen. Another printing deterrent is the “Print to PDF” option in MS Word. Bring your conscience back into the frame and view it on your phone or tablet instead. Do you really need that on paper? According to Cisco, the invitation design company Majestic Invites saves $50,000 each year having left paper behind. They are a small company with eight employees, so this should be a great encouragement to any small business owner. You’re probably thinking, “Can my company really achieve this?” Whether you own a bakery or a real estate firm, this is an attainable form of operation. It’s just a matter of planning the transition, or, if you’re just starting up, working out what you can afford from the get-go. Think about emails, digital newsletters, and online workflow systems. The movement toward a paper-free world has been going on for a long time. I can send my invoices as email attachments instead of mailing them. I get receipts via email from online stores—and your clients could receive them like this too. I don’t even print out holiday or event photos anymore; they’re all digital. A difficult area to eliminate paper usage might be product packaging. If you ship items out to customers, chances are you’ll want to use a box or an envelope and an invoice. 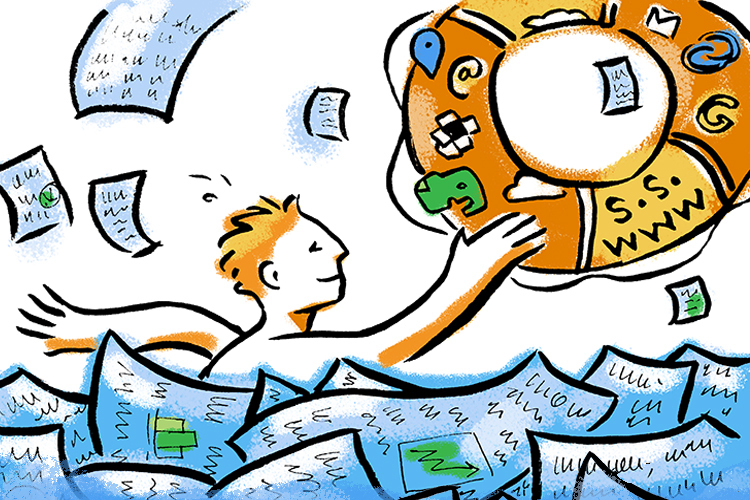 For most companies, paperless is a vision; a goal for a few years down the line. There will be few long-established companies without records still in need of digitization, but chances are they’re on the way there. Google, Dropbox, and many other companies offer gigabytes of online “cloud” storage to individuals and companies alike. They make it easy to save, edit, and share files with colleagues—and the files are secure, too. I use Google Docs to write my articles, and services like Evernote to find, organize, and discuss ideas. I don’t have a paper copy of any article I’ve written in the last three years. It simply isn’t necessary. In short, if you’re like me and like to type all your work, you can probably go without printing it at all. Editing your files on the go is another advantage of cloud-based services. Most big cloud companies have smartphone and tablet-compatible apps, which mean you’re not restricted to working in the office or at home. Sending large files should not be an issue either. You can do this with online services like Hightail and WeTransfer. Forget faxing, and don’t even think about the mail. Digital subscriptions: Receive the latest copies of magazines and newspapers online. Newsletters can be digitized: Send them out via email or publish on your website. Moo Business Cards+: NFC technology (Near Field Communication) to transfer your data to people’s phones. Carry one business card with you instead of fifty. How can you escape the hefty accounting ledger and tax forms? There are numerous digital accounting services like QuickBooks (which can be integrated with your LivePlan account), Sage, and Xero. These programs help you send invoices, track expenses, and pay your employees, and they’re easy to use. Specialized invoicing software is also available, such as FreshBooks and Zoho Invoice. These are programs through which you can create invoices, quotes, and orders, and get paid online. Automation is a key benefit of moving from paper to digital. Online systems are becoming more intelligent and it’s making many aspects of business management much more straight forward. Clients can be reminded by your system that they have an appointment tomorrow, instead of receiving a reminder in the mail, and their receipts can be sent to them via POS systems. What is a POS system? These are the devices that plug into your cloud-connected smartphones or tablets and allow you to take card payments on-the-go. They’re a modern alternative to card machines. Some top examples are PayPal Here, Square, and Intuit GoPayment. The move toward paperless is an opportunity, rather than a problem. It may challenge you as a business owner, but when you’re not challenged, you’re not learning. Management can “approve” changes and decisions in shared files, and tools such as DocuSign exist which facilitate the signing of documents on a smartphone or tablet. Digital processing programs can integrate with your current systems for increased operating efficiency, and clients can be shown how to interact with you online. Alternatively, you can scan and save the papers they send, and recycle them afterward. Keeping digitized records avoids the possibility of document loss and adds a level of security, privacy, and confidentiality. If you own a smartphone or tablet, you can have the file anywhere when it’s in the cloud. Many of us already use the current alternative devices and services in our personal lives. Even one-fifth of Majestic Invites’ $50,000 savings would be a welcome result for the year. There are many ways you can start working toward that goal, so I advise making one or two small changes at a time, and gradually build them into your procedures. You’ll know what you can and can’t achieve at any given time. James is a freelance translator and copywriter from the UK. He has worked as a project manager for one of the UK’s leading advertising agencies, as well as a number of fast-growing translation firms in London. When he’s not working with words, he’ll be relaxing on the golf course or helping out with the family business.